Fantasmic vs. Illuminations dessert party? I've seen some beautiful photos of brides and grooms during the Epcot fireworks. We plan on having a DP after our Memories vow renewal. Can we get DFAP to come and photograph us there? Or is that just for Wishes weddings? As a memories bride, you'll be working with Disney's Catered events to set up your dessert party instead of DFTW. When I inquired with a similar question last year - we were planning memories but ended up eloping at home - they said we could, but it would be around $400, I think. 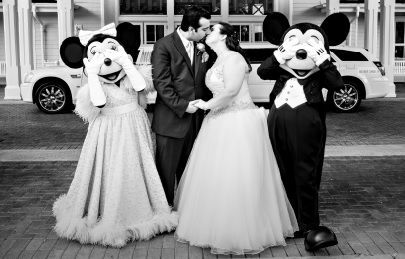 If you haven't found them yet, I would listen though the Disney Wedding podcast episodes for Memories collection events and for dessert parties. You'll get a ton of info from those. If you have to book through Catered Events, you will not be able to wear your wedding dress to your dessert party. You can find other options that might work (tea/short length wedding dress might work), but I thought I'd give you advanced warning. I believe in 2014 it was $360 for DFAP to be there for our Dessert Party, but it was all booked through DFTW. Thanks! Appreciate the warning. Guess I'll just have to shop for 2 dresses! I'm leaning toward Epcot for the DP, but was wondering about HS. Think I am sticking with Epcot. I would do Epcot and then have the ride mix in with Soarin'. It's a much more tame ride for your guests and it is a pretty cool ride! I wanted fantasmic dp but my planner said "because of the exciting changes coming to Disney's Hollywood studios there will not be any fantasmic dp planned for the foreseeable future" so now we are doing epcot! I was wondering if the construction would impact those! Ya I was so upset because I worked at DHS when I did the college internship so it meant a lot to me. But Epcot knows what they're doing with welcome parties/dessert parties so I'm happy. I also am doing France which I don't think I've seen a lot of brides do, so I am excited! I'd love to do a dessert party in Studios in one of the other locations, but I'm thinking it's a long shot, because of all the construction.